While this next app may appeal to the millions of little girls, tweens and teenage boys who drool over Miley Cyrus’ every move … let’s not be naive. 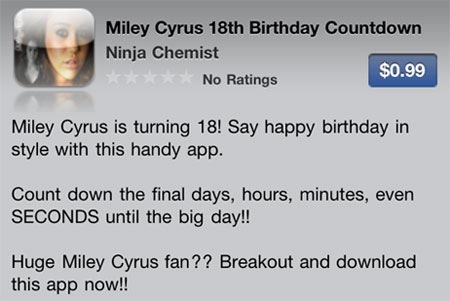 You know damn well all those Maxim perverts and dirty old men are downloading it to celebrate Miley becoming legal … and wishfully hoping for the “Hannah Montana Gone Wild” video after the app expires on November 23, 2010 (in 112 days). But at least Apple hasn’t approved a Justin Bieber legal age countdown application … yet. If it works as a countdown to when her show is off the air, I'm in.